Children love science, even if they don’t think they do: it’s all down to how engagingly it’s presented to them – whether in school, on television or through digital content. 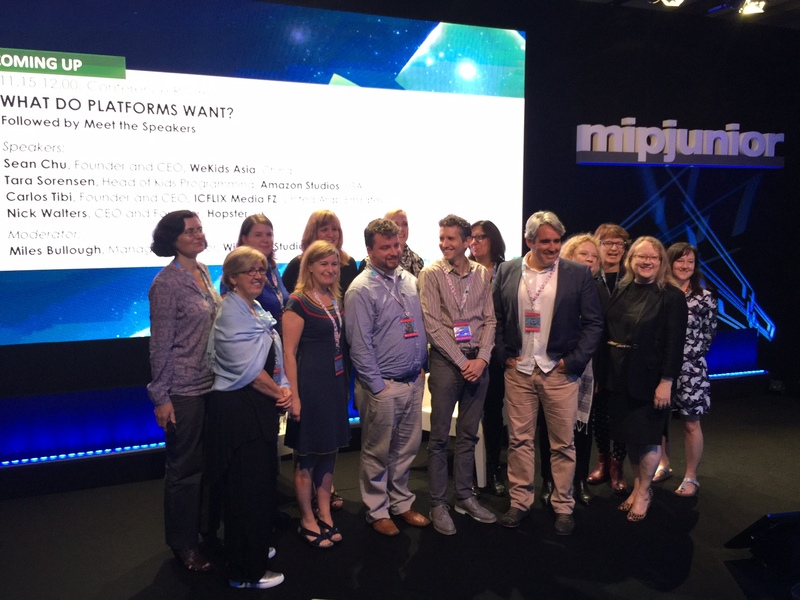 This morning, MIPJunior was treated to a showcase of the latest science “edutainment” coming out of Canada, presented by the Canada Media Fund – whose president and CEO Valerie Creighton (centre in above photo) hosted the session – and Telefilm Canada. Carlos Soldevila from Trio Orange in Quebec presented L’Académie Secrète and Top Science. “The world is a magical place whether you’re five years old, eight years old or 60 years old. And we see science as a way to reveal this magic,” he said. The first show focuses on an investigative duo running a detective agency to find the answers to children’s scientific questions. The second is a brand new show where two families compete in a series of scientific challenges. “We are very lucky to have broadcasters that have confidence in us to write these stories and do crazy stuff for kids,” said Soldevila. Next, Blair Powers (second from left in top photo) from Sinking Ship Entertainment in Ontario presented Annedroids, a CG/live-action hybrid series that airs on Amazon in the US and UK, and on other broadcasters and services around the world. Each episode involves the Anne character testing a new hypothesis, with the narrative driving the science. “We really want the show to inspire viewers to think about science beyond their TV experience or their cross-platform experience,” said Johnson. Next, Jonathan Finkelstein from Apartment 11 Productions in Quebec presented Look Kool / C’est Wow. He started by saying that it’s vital for science-related shows for kids not to just feel like another dose of school education. “When you’re tasked by your educational broadcaster to produce a show about math… you come up with a show focused on geometry, on shapes, because that is math too. And you know you have to put the ‘tainment’ into the ‘edu’,” he said. “When you create an educational kids TV series, the education is the easier part: you have a curriculum and educational consultant,” he said, adding that the entertainment is harder. Look Kool / C’est Wow uses a range of tactics, including putting children at the centre of the show with their shape-related questions, and plenty of innovation with the content. The show is onto its second season, broadening the subject matter out to topics like probability, size, angles, patterns and “measuring elephants”. Marilyn Kynaston from Picture Box Distribution in Ontario presented Prime Radicals, which was produced by GAPC Entertainment. It’s also focused on maths, with its own range of spin-off apps and a website. “Prime Radicals is a curriculum-based series,” said Kynaston. It has two seasons for a total of 52 15-minute episodes. Each episode includes a visiting desk: “A maze builder.. firefighter, kite-boarder, or chef to help them solve mathematical problems,” she said. Kynaston said that there’s “a lot more respect for STEM-focused series and a desire for this kind of programming on the part of broadcasters, parents and kids” – STEM being shows focused on science, technology, engineering and maths – and noted that the broadcast demand is not just coming from national broadcasters, but from commercial channels too.